Traveling by bus to Toronto is an excellent and cost-effective way to see all this great city has to offer including its beautiful scenery, the fascinating culture and ethnically diverse people who have made their homes here. When you travel to Toronto by bus, you will likely find yourself at the main bus terminal serving the city which is known by a few different names - The Toronto Coach Terminal, The Bay Street Terminal and The Metro Toronto Coach Terminal. 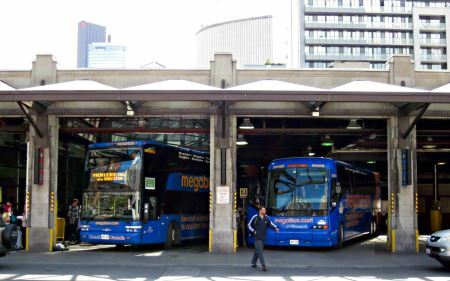 The city is served by several different bus companies who operate from the main terminal including the popular Greyhound along with Coach Canada, Megabus and Ontario Northland. Why Take Bus to Toronto? Bus carriers provide frequent bus service to Toronto from several major cities and even small towns. Also, you have more flexible route options at your disposal. Bus travel is considerably cheaper than trains, planes and even automobiles thanks to the high price of fuel, allowing you to save some $$$. Travelling by bus to Toronto brings you directly in the heart of the downtown Toronto. You can enjoy the scenery through wide panoramic windows. Nevertheless, sometimes taking a bus to Toronto might be little bit tedious and lengthy journey depending on where you are coming from, specially if it involves frequent stops, layovers and transfers. Ideally, I do not recommend travelling by bus to Toronto, if it involves more than 15 hours of ride. Greyhound is the most recognized and well respected company in North America, giving visitors the chance to see the largest city in Canada by bus and offers service from Toronto's main bus terminal. From just about anywhere in Canada and United States you can travel by bus to Toronto. Note that it's not viable to give sample fares because they change very quickly. Travel times also fluctuate very much due to layovers, transfers and traffic jams, making it very difficult to provide approximate data. If you want to use Greyhound's commuter services, Greyhound Quicklink provides service between Toronto and cities such as Barrie, Brantford, Guelph, Kitchener, Peterborough, St. Catharines and the beautiful Niagara Falls. Greyhound offers unlimited travel passes as well as various discount fares to take advantage of throughout the year. Your best bet is to buy tickets well in advance to get up to 50% discount. Buying a Greyhound ticket is not only affordable, but simple too. Greyhound offers you several ways to buy a ticket. You can buy tickets online, over the phone (US: 1-800-231-2222 using credit card, Canada: 1-800-661-8747 using Canadian credit card), at a Greyhound terminal or at a Greyhound agency. For more information visit www.greyhound.ca (Canada), www.greyhound.com (US) or call Greyhound Toronto on 416-594-1010. Megabus offers low cost, daily express bus service in partnership with Coach Canada. The carrier operates motorcoaches equipped with on board restrooms. They also offer Wi-Fi access, reclining seats and even Double Decker buses on selected routes. Tickets are available online, or you can buy at the bus terminal. For more information visit www.megabus.com or call 800-461-7661 (toll free) or 705-748-6411. NeOn is a joint operation between Greyhound , Adirondack Transit and Passengerbus Corp which provides premium service at reasonable low price. You can enjoy all new coaches offering free Wi-Fi and plug-ins for your gadgets. The extra legroom allows you to stretch your leg and seat belts on every seat give you much needed peace of mind. At present, NeOn links Toronto with New York via Buffalo, Buffalo Airport, Rochester and Syracuse. The NeOn offers two buses daily from Toronto and New York, one in morning and one in late evening. You can buy tickets online at www.greyhound.com, over the phone (US: 1-800-231-2222 using credit card, Canada: 1-800-661-8747 using Canadian credit card), at a Greyhound terminal or at a Greyhound agency. Coach Canada offers safe, reliable and convenient bus services to visitors. You can buy tickets online (sometimes it's not possible to buy e-ticket for a travel on a desired date since some cut-offs periods may apply), from Coach Canada agent or at the bus terminal. For more information visit www.coachcanada.com or call 800-461-7661 (toll free) or 705-748-6411. Ontario Northland provides service from the remote northern parts of Ontario. You can enjoy your ride in the coaches equipped with air conditioning, an on-board restroom and comfortable, reclining seats. You can purchase tickets for the bus at one of bus stations or through agents. How to Get Cheap Bus Fare to Toronto? Plan your travel well in advance. This will help you to save quite a few bucks on ticket fares, sometimes even up to 50%. Look for senior discount, child discount, student discount and other available deals for you and your family. You can save a few dollars with round trip ticket. If feasible, buy a round trip ticket instead of one-way ticket. Buy tickets online whenever available and possible. You may get cheap web-only rates and definitely avoid the hassles of buying your ticket at the terminal and save your time by avoiding ticket queue. No reservations are required and there is no assigned seating. Seats are allocated on first-come, first-served basis. You should arrive at the terminal at least half an hour before your scheduled departure time. During the weekends and holidays it's good idea to arrive well ahead of schedule to ensure your seat. Bring all necessary documents if your travel involves US-Canada border crossing. Bring some snacks, water bottles, books or some other reading material and a small pillow for comfortable ride. The Toronto Coach Terminal is the main bus terminal serving the city. The main entrance to the bus terminal can be found on Bay Street which is just north of Dundas Street. You shouldn't have any trouble spotting the bus terminal's departures building which encompasses the entire northern end of the block surrounded by Bay, Dundas, Edward and Elizabeth Streets. And, from the Toronto Coach Terminal's departures building you will find the arrivals building is located directly across Elizabeth Street. If you ever have any problems when taking a bus, don't hesitate to ask someone as the overwhelming majority of people in Toronto are friendly, helpful and more than willing to give assistance to tourists visiting their fine city. When traveling by bus to Toronto there are a few things you will want to keep in mind to make your experience as pleasant as possible. First, the bus terminal features rather small spaces for passengers to queue while waiting for their coaches and queues for commuter coaches tend to be quite long at times making it important for passengers to plan accordingly. Also, some platforms are poorly marked so you will want to ensure you are waiting in line for the correct bus. Again, the residents of the city and those working at the terminal are more than willing to help tourists. 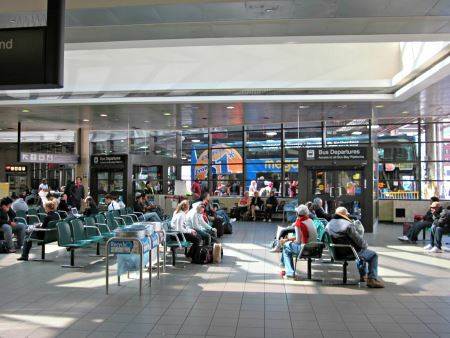 The Toronto Coach Terminal facilities include a Ticket and Information Office and a spacious indoor waiting facility. At Toronto's main bus terminal you will find lockers available for passengers to use at a price of $3 for 24 hours. Tokens must be purchased from token machines located near by the lockers. If you have items too large to store in lockers, they may be kept at the information booth for an additional fee. So hop a bus to Toronto, enjoy all the sights and sounds of your trip while leaving the driving to someone else.